2 for Tuesday is our favorite day, and today is no exception! These pieces make the perfect gift! Just think you could have your teacher appreciation gift, and your BFF’s birthday gift all taken care of today! Or load up on some fun jewelry for Mom for Mother’s Day! 2 Necklaces for ONLY $12.00! The code is 2FORYOU and it makes each piece ONLY $6.00 each when 2 are purchased! Don’t forget the FREE Shipping! The code is valid Tuesday, 05/08 ONLY! Hey, lovely! 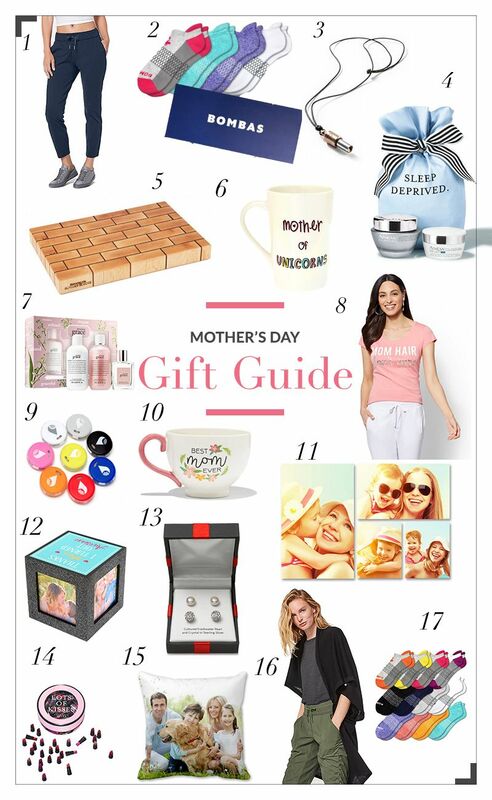 Welcome to the 2018 MyStyleSpot Mother’s Day Gift Guide – where I’ve compiled 17 of my favorite gifts – perfect for Mom! With four-way stretch and travel-friendly fabric, these Lululemon 7/8 pants help moms take adventures in stride. A mother’s day gift that comes completely ready – no wrapping or tissue paper needed! The women’s Bombas gift box features four pairs of brand new Bombas socks in a gift box that will make mom beam! The Grommet discovers unique Mother’s Day gifts that are meaningful and memorable—just like her. This week only, get up to 25% off Mother’s Day products like the LoveTuner Necklace! Mom will look like she’s had hours of sleep, even if she hasn’t, with the two skin care pick-me-ups included in the Anew Sleep Deprived Collection. Both come in a pretty gift bag tied with a bow! This Made in the USA, end-grain butcher board was built beautifully and built to last. Each board will age gracefully and stand the test of time, just like mom. This fun mug is perfect for any mother of unicorns with a white iridescent finish complemented by a multi-colored font. Take 40% off Mother’s Day products through 5/10. Embrace your mom’s beauty with Philosophy’s Amazing Grace Eau de Toilette from JCPenney. It’s their bestselling, amazingly clean, and beautifully feminine scent featuring notes of bergamot and Muguet blossoms. This “Mom Hair, Don’t Care” graphic tee is perfect for every mom! The TrackR pixel is a small, light and bright Bluetooth tracker. With a loud ringer and LED lights, you can find almost anything, even in the dark. Take 25% off sitewide with the code GREATGIFT. Is your mom a coffee lover? This “Best Mom Ever” ceramic mug is the perfect way to remind her how much you love her each time she takes a sip of coffee. Take up to 93% off custom made canvases for mom at Canvas Champ! Fill this cube from Claire’s with four different photos of you and your mom to capture all of your favorite memories with mom. Shop for mom at JCPenney. Rewards Members can get a $50 set of pearls studs and crystal studs for only $10 while supplies last! Give mom lots of kisses with this limited-edition assortment of 60 lipstick minis in a box labeled “Lots of Kisses”. Give a distinct touch to your living room with personalized photo pillows. Plus take 65% off a custom photo pillow and another extra 10% discount with the code PILLOW10. Versatility never felt so good. Moms can wear this splendidly soft Lululemon wrap multiple ways thanks to the rectangular shape and rows of snaps at either end. Mom has enough things to worry about. Socks won’t have to be one of them when she has this Bombas 12 pack. Get twenty percent off your first purchase of Bombas with the code MOTHERSDAY!